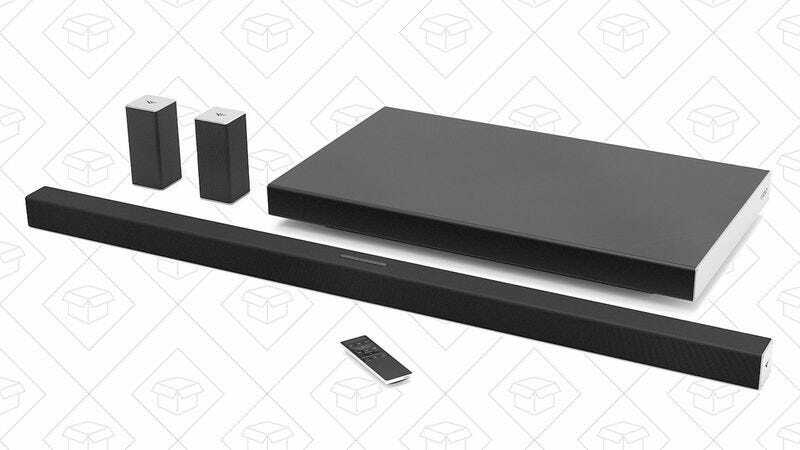 If you’ve always wanted surround sound at home, but have been scared off by its cost and complexity, Amazon’s running the a great deal on Vizio’s turnkey 5.1 sound bar system. This is a newest version of the system than we’ve written about in the past, but it still has all the same features, plus a few new tricks. The biggest change is the design of the subwoofer; it’s now slim enough to fit under a couch, making the system even less obtrusive. It also includes Google Cast support for seamless audio streaming from over 100 popular apps, without futzing around in your Bluetooth settings. Like the previous models though, the 45” sound bar still plugs directly into your TV over optical or HDMI-ARC, no receiver required. And the wireless subwoofer still acts as a receiver for the two wired satellite speakers, meaning you won’t have to run a cable from your TV to the back of the room. I have the 38” 2015 model of this system, and absolutely love it. Today’s price is within a couple bucks of an all-time low, and about $100 less than usual, but it’s only available for Prime members. If you got a fancy new TV for the holidays, this highly-rated Simbr mount will hang it on the wall for $20 today with promo code ALYM2G3D. This model can articulate in any direction, extend anywhere from 2”-16” from the wall, and hold any VESA-mountable TV from 17-55”. If you’re having trouble staying warm and toasty while you sleep, one of Amazon’s Gold Box deals today is on down alternative duvet inserts from ExceptionalSheets. These comforters come in three sizes, have fantastic reviews, and are about $15 less than usual, today only. You know those little jerky snack packs that cost like $6 each at the airport Hudson News? You can get nine of them for $12 on Amazon today when you clip the 15% coupon. I’ll be on the lookout for deals on floss too. Just because you’re outdoors and/or floating on a body of water doesn’t mean you can’t have something comfortable to sit on. This $29 inflatable blob might not be the most comfortable piece of furniture you own, but it certainly beats sitting in the dirt. This particular model includes a water bottle holder and three side pockets. Apples To Apples is basically Cards Against Humanity, but family-friendly. Not a single Nazi card in the whole deck. And yes, I know Apples To Apples came before CAH, don’t @ me.